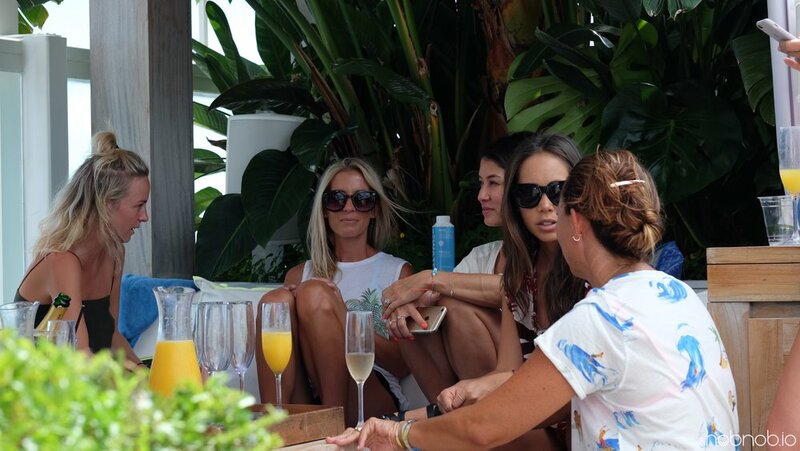 In the flurry of bikini-clad catwalk shows, industry meetings, and party-after-party that is Miami Swim Week, Jennifer Binney, visionary of surf chic lifestyle brand Samudra, used Hobnob to get the gals together for ‘Monday Morning Mimosas’ and some much-needed chill time. Amid her everyday hustle, it’s moments like these when the Hawaii-based fashion CEO usually makes the magic happen—in gathering her tribe, whether in Mo’orea, Maui, Byron Bay or Montauk. As an entrepreneur, Binney has established herself as a vanguard in the beach luxe realm with her first venture, a jewelry line that coined major trends in the islands in the early 2000s. Through her worldly travels, her network and vision for accessorizing a fashion-forward beach lifestyle grew, and Samudra was born. Her signature pouches—simple zippered canvas enclosures emblazoned with fetish-worthy images of colorful palm trees and dreamy oceanscapes—took the idea of a “beach bag” and made it a statement piece. Her esthetic is equal parts surf chic, vagabond dreamer, and pop-art (neon, as it turns out, is Jennifer’s kryptonite.) It’s captured the heart of fashion insiders like Garance Doré. In fact, for women everywhere, Samudra translates a carefree attitude of salty hair and sandy feet to city streets. Her pieces identify a global tribe of topical gangsters, and she even coined the hat to prove it. Creative synergy is one of the strengths of the Samudra line, which has grown to include swimwear, cover-ups, beach wear, and more bag and tote styles. Many of Jennifer’s limited-edition collections are done in collaboration with photographers and designers that she’s has met along her travels. The most recent project, the new Samudra x Aloha Collection splash proof pouches, premiered at Miami Swim Week. Without a doubt, Samudra’s zesty palm images on Aloha Collection’s brilliant Tyvek covered bags = the next must-have poolside accessory. For Monday Morning Mimosas, a casual respite during a busy Miami Swim Week, Jennifer and Hobnob Invites partnered to welcome an intimate group of fashion designers, journalists, bloggers, and industry peeps together to reflect on the week, share stories, and maybe even spark ideas for future collaborations. Rocking her signature top bun and rubber slippers, Jennifer greeted friends with champagne, OJ, and effortless aloha in a cozy rooftop cabana at the oceanfront 1 Hotel on Collins Avenue. The late morning sun sparkled off the azure water below as fellow fashionistas joined in, Mikoh founders and swimwear designers, sisters Oleema and Kalani Miller, Bethany Mayer of Surf Bazaar, and Sydney/ NYC based blogger Nadia Fairfax to name a few. The dress was casual, but sleek sunnies seamed mandatory. The relaxed hum of girl talk belied the megawatt style power in the room. But, that’s exactly Jennifer’s vibe. With one foot in the fashion world and the other in the sand, she radiates style without the pretension—an easy feat for anyone who surfs before breakfast and calls staring at palm trees a hard days work.